This has to feel pretty good for Nissan. They have taken their sub 100k "supercar", and put it squarely in the sites of most car manufactures, enthusiasts, and comparison tests. 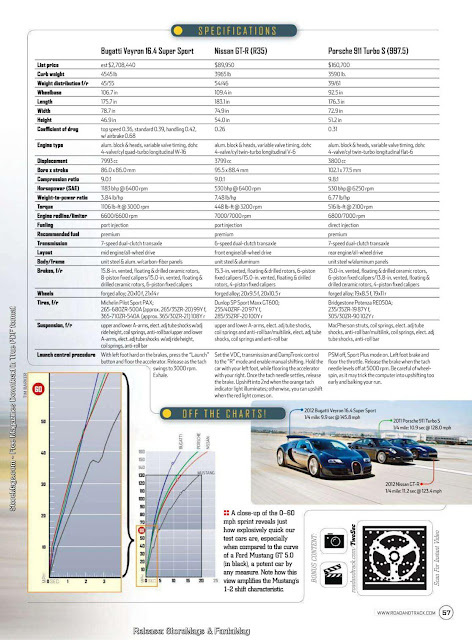 In this article and video by Road and Track Magazine, they take three all wheel drive cars, and run some tests, and provide a good amount of data. The Bugatti Veyron Super Sport comes in at a spare change like $2,700,000. The Porsche Turbo S rings up the cash register at $160,700, and the Nissan GT-R $89,950. It is pretty unlikely that car buyers would be cross shopping the three models. 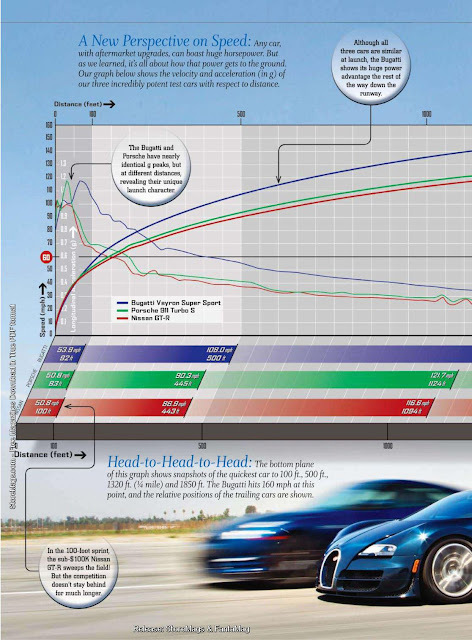 However, the most important part of the whole article, the Nissan GT-R wins to 100 feet. I mean, all that really matters is that first hundred feet, after that, who cares? The Nissan whips up on the Porsche Turbo S, and the Bugatti Veyron. Click though for the video. Well, maybe after that, the other cars have the advantage, but when you are the little guy on the block, you take your wins where you can get them. The Veyron weighs 4545 lbs, and if you have ever seen one in real life you realize its really not a large car, but it does manage to push a lot of air out of its way quickly. Top speed of 258 mph. The other two cars can't even pretend to come close to that number. The GT-R is next heaviest at 3965 lbs, and the lightweight? Porsche Turbo tipping the scales at 3590 lbs. We should be seeing some video coverage and the full article soon. So whats next for the Nissan GT-R? Are they going to add direct injection like the Porsche? Direct injection could help both emissions, and fuel economy. Some more power? The rumors so far say that we might see some more power for the 2013 Nissan GT-R. How about another gear. A 7th gear can give better fuel economy, and perhaps even better acceleration, and more top speed.